Abejas: ¿Qué diversas pueden ser? Bees: How diverse can they be? Click HERE to sign up for the bimonthly newsletter. Our research group at the University of California has been working since 1987 on documenting bee diversity and bee frequencies on wild California plants in several northern California sites. This research led to a series of new bee sampling methods that we used to start the urban bee project in the late 1990s. After several years of sampling in residential areas of the East Bay region of the San Francisco Bay Area (SFBA) we have found about 90 species of bees, most of which are native to California. Once sampling is completed in other urban residential areas of the SFBA, we expect this number to increase well beyond 100. We have found that the bees have definite preferences for plants and that certain bee groups can be expected to forage for pollen and nectar on certain plants, and at certain frequencies, regardless of whether the plants are native or exotic to California. We have used this information to create an experimental bee garden, with the most preferred plants on the Berkeley campus of the University of California. The garden is also serving as an outreach tool for advising gardeners, teachers, and other urbanites on planning their own gardens that will encourage bees and other flower visitors. Since this early work document urban bee diversity in the East Bay, we have surveyed urban gardens around the state and exported our habitat gardening model to farms in both Contra Costa County and Ventura County, studying pollinator diversity in agroecosystems. 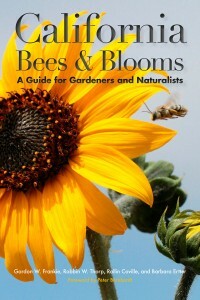 "California Bees & Blooms: A Guide for Gardeners and Naturalists" is now available for purchase from Heyday Books!!! !